The Somali government has announced a state of emergency to deal with the uptick in terror attacks. Mogadishu (HOL ) – Following a weeklong series of deadly attacks by Al-Shabaab, the Somali government has implemented new measures to restore the shattered peace in Mogadishu. For the first time in decades, the city’s mayor, Abdirahman Omar Osman has declared a state of emergency on Saturday evening aiming at improving security in the embattled capital. 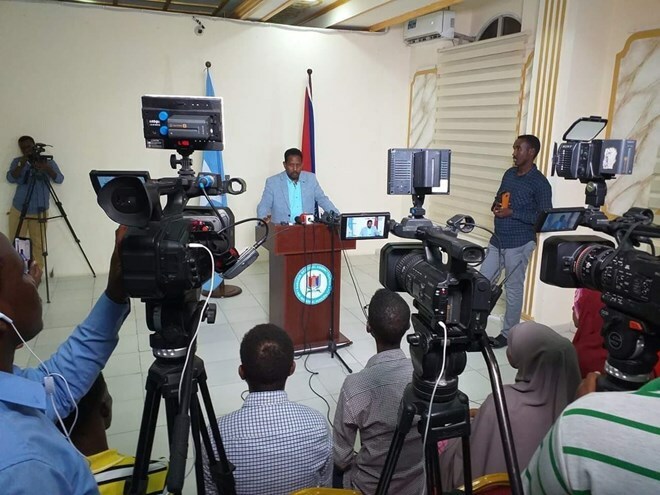 Speaking to the media, Osman said during the untimely emergency, his local government will provide buses and ambulances to residents for emergency cases. The mayor vowed that the government forces will launch door to door searches to smoke out al-Shabaab elements in Mogadishu. “The government forces will carry out a security operation in all the city’s neighbourhoods, the forces will search house and vehicles,” the mayor told the reporters. Since 21st March, Al-Shabaab had carried seven attacks in Mogadishu, killing 49 people most of them civilians. On Saturday, Somali Defense ministry has carried out a mini-reshuffle in the country’s army to curb the increasing insecurity. In a statement, the Minister for Defence, Hassan Ali Mohamed appointed Abdi Hassan Mohamed as the new deputy commander of the Somali National Army (SNA). The immediate former SNA force commander, Odawaa Rage will be the army’s infantry commander while Abdirashid Abdullahi Shire appointed to be his deputy. The government has vowed to launch offensives against Al-Shabaab fighters in southern Somalia. In an extraordinary cabinet meeting, the Internal Security Minister, Mohamed Abukar Islaw and his Defense counterpart, Hassan Ali Mohamed were questioned about the recent attacks and the insecurity. Chaired by Prime Minister Hassan Ali Kheire, the members of the cabinet members discussed ways to beef up the security and the fight against terrorism. According to a statement, the cabinet approved plans to enhance the security and liberate areas controlled by Al-Shabaab militants.